ImageEngine is an automatic image optimizer built on WURFL device detection. WURFL will detect the device capabilities, including screen size and image format support, resize and optimize the image accordingly. That's why we call it the ImageEngine. ImageEngine is not only for mobile as it also supports the emerging Client Hint standard, making it the perfect companion for Responsive Images. Image weight is by far the most important challenge to address to optimize a web page for the plethora of devices on the web today. This is why ImageEngine will instantly give your users a better experience by reducing page load time. Not to mention the reduced data cost. ImageEngine works as a CDN and can be referenced by the unique hostname you get assigned, or by pointing your DNS to that hostname. A 30 day trial of ImageEngine is available at no charge. Just sign-up and start testing. Even if you can point your DNS to your ImageEngine host directly, the easiest way to test ImageEngine is to simply prefix your image URL with the ImageEngine hostname you got assigned. In the below example, the size of the image will be equal to the detected screen size of the requesting device. However you may also pass a set of parameters to the ImageEngine service as seen below. The below example would return an image sized to 50% of the screen width. A full list of parameters can be found here. See what ImageEngine can do for your site! Enjoy full HTTP/2 support out of the box. ImageEngine will automatically serve your images over HTTP/2 when TLS is enabled. I.e. if you reference your images using https://. HTTP/2 has significant impact on speed and lead-time of your images. ImageEngine has full support for Client Hints. Client Hints enables ImageEngine to be extremely accurate in determining optimal size and format for images. Even for responsive designs with completely fluid images. Think of it as server side responsive images. WebP is one of the most efficient image formats on the web, yet not widely used. ImageEngine will convert any format to WebP for browsers supporting this format. This will save your end users for additional bytes to download. Mobile devices see a background image. Navigation is optimized to your device's form factor. Google Analytics is collecting information about the device through custom variables. In development, you may pass debug=true to the query string to disable any caching. The name the device is known by. Typically make and model, a "group" of devices, or a more generic definition. May return any of these values: Desktop, App, Tablet, Smartphone, Feature Phone, Smart-TV, Robot, Other non-Mobile, Other Mobile. If you monetize your site or blog though advertising, you may be relying on multiple ad networks. Some networks are better at targeting mobile traffic, while others do a better job with regular desktop web traffic. WURFL.js helps you decide which one is better for each user. This may increase your CTR. Based on information WURFL.js provides, such as a device make and model, form factor and whether it is mobile or not, you can create a personalized experience for your users. You can even use it to increase speed and performance for your mobile users, just as we did on this demo page. Designing a great user experience starts with knowing your users. WURFL.js provide information that is not available elsewhere. This information can be put into analytics tools such as Google Analytics and be the basis for custom reports that are more accurate than the standard ones. The WURFL.js Basic, Standard and Pro license supports different commercial use scenarios (single and multiple domains, enterprise-wide use, intranets, and OEM arrangements). ScientiaMobile can extend pricing to support non-standard commercial agreements that require additional domains (e.g. OEM). Please contact our sales for these arrangements. 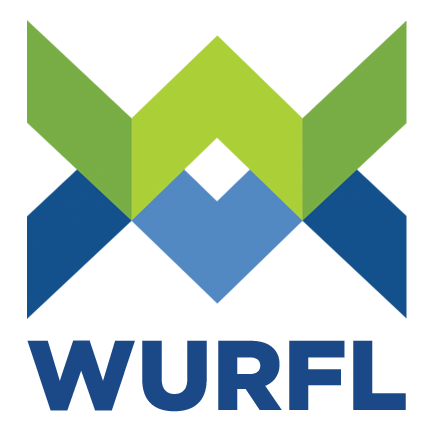 WURFL.js Basic, Standard, and Pro plans operate on a highly-available cloud-based infrastructure that is dedicated to our commercial customers. WURFL.js Basic, Standard and Pro plans (collectively known as “WURFL.js Business Edition”) terms of service. For WURFL.js, you may use Enterprise Support Portal if you have questions or need support. Similarly, you can use Enterprise Support for ImageEngine. Proudly brought to you by ScientiaMobile, Inc.
2019 - ScientiaMobile, Inc. All rights reserved. WURFL® is the registered trademark of ScientiaMobile, Inc. Accessing our website assumes knowledge of our Terms and Conditions.